Usually when we travel overseas, we just exchange dollars for local currency when we get to the airport. However, for this trip I decided we needed to purchase some Euros ahead of time. We will be arriving in Paris on a Saturday afternoon and will need a substantial sum in Euros to cover the balance owed for the rental of our apartment plus a hefty security deposit. I was concerned that it might be challenging to get this amount at the airport or somewhere in between there and the apartment. I didn’t want to fret about this during our 10 1/2 hour flight. I hope to be sleeping like a baby instead… yeah, right. 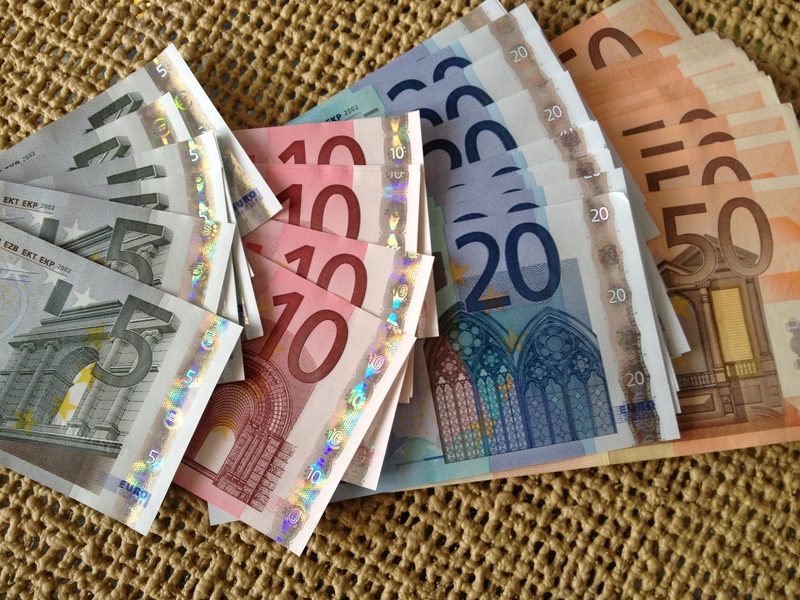 About 2 weeks ago I went to a branch of our bank near my workplace and inquired about ordering Euros. I was told I could order them any time during banking hours and that it would take about 3 business days for them to arrive. The exchange rate was somewhat higher than in France which adds up when your need a large amount. I was advised that I could check around for other rates such as those offered by the popular Travelex stores found in many shopping malls. Their exchange rate was even higher. Somewhere online I found some information stating that you could purchase Euros through AAA. It would be great if my membership actually provided me with some benefits I could use. Next step was to look into that. Turns out they no longer offer this service (of course!) but were willing to give me some advice = go to your bank or the travel exchange store in the mall. Hmmm… for this I pay AAA. Back to the bank I went, but a different branch this time — only to be amazed once again at the lack of service and knowledge that you get from any professional institution these days. “Can I help you?” a too-young and obviously inexperienced customer service representative asked. She insisted there would only be three choices once I clicked on Customer Service which was partially true though each one had at least a dozen sub choices. I managed to navigate through the process fairly easily, but when I printed the confirmation page, I realized to my horror that the bank still had our 7-year old, no longer in service landline phone number from a previous residence listed. I had been told that the bank would call when the Euros arrived so I could pick them up. Frantically, I clicked back to the Customer Service tab and updated my profile with the correct phone number. I thought I’d better confirm that the people arranging for the Euros would be aware of this update so I used Live Chat in an attempt to find out. There I learned that I needed to contact the Foreign Exchange Team by phone and that they were available until 6PM PT. Since it was only 5, I figured I could jump right on that and get to the bottom of the whole issue today. NOT! The recording I received stated that their hours ended at 5PM and they were closed. Well, there’s always another tomorrow, thank goodness!! Epilogue: Finally got through all the red tape without any other snafus and voilá, I am now in possession of some beautiful new Euros bills. Unfortunately, they probably won’t last very long.